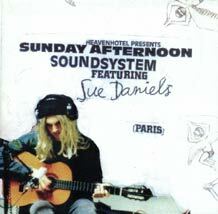 This is about the solo project of Sue Daniels, who, in 1998 at the age of 17, started recording the CD “Paris”. Basic recording and programming were done at home on his pc. For two years he worked on the recordings in the ghosttownstudio’s during his schoolholidays. At a certain point he mailed some results to Rudy Trouvé, who liked it very much, and after this was playing a major guest-role, also inviting Sigrid Van Rosendaal, Mauro Pawlowski and Elko Blijweert to participate as guest-musicians, and released the CDs under the Heaven Hotel label. Sue Daniels does not like publicity or promotion, only one interview was ever done at Studio Brussels. 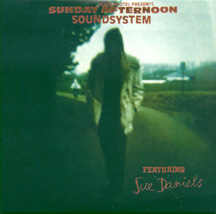 Sue Daniels sees himself as a “techno singer-songwriter” untill he finds a better definition. He claims to be mainly influenced by Nick Drake, Nick Drake, Nick Drake, Aphex Twins, Leonard Cohen, Howard Shore and some “gabbercompilations”. PARIS is produced by Geert van Bever, who for Heavenhotel also recorded Goreslut, Dead man Ray and Horrowitz. Untill now a 45′ vinyl single, Comfort and the single Constant raving and full album Paris were released on Heaven Hotel. 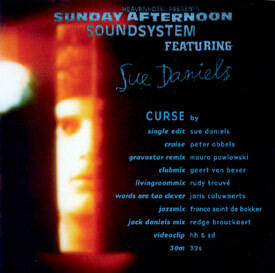 There is also the compilation ‘Curse’, on which a cover of the single is done by different Heaven Hotel bands in their own unique styles, including a 30 minute video-clip.